This chandelier design is based on the exploration of going deeper into what is. What makes up the world we inhabit? What is the structure of the universe? The scientific community provides a diverse spectrum of theories that amaze and inspire the mind. Wave, particle, frequency. The chandelier design is a manifestation of an abstracted shape derived from the string theory, a branch of theoretical physics. It is an artistic interpretation of a visual representation of what is. 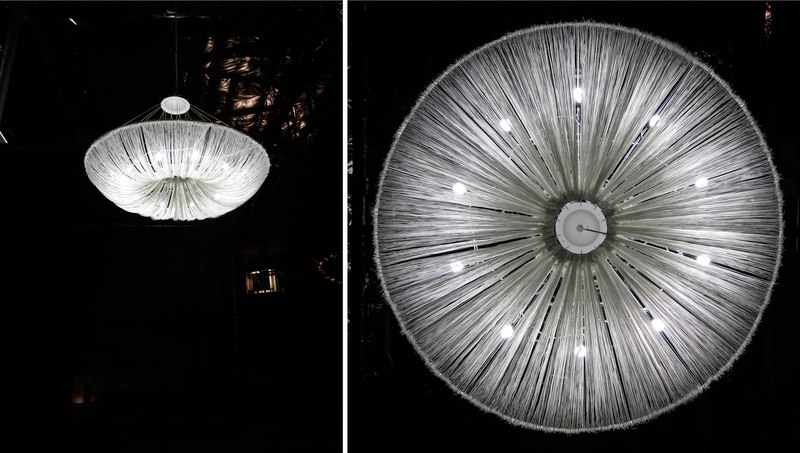 The structure is a hybrid of traditional chandelier form, fabric ceiling installation, and hanging sculpture. 17,000 ft. of string is used to create String Theory. Everything besides the string and electrical was salvaged from The RE Store in Bellingham to make String Theory. 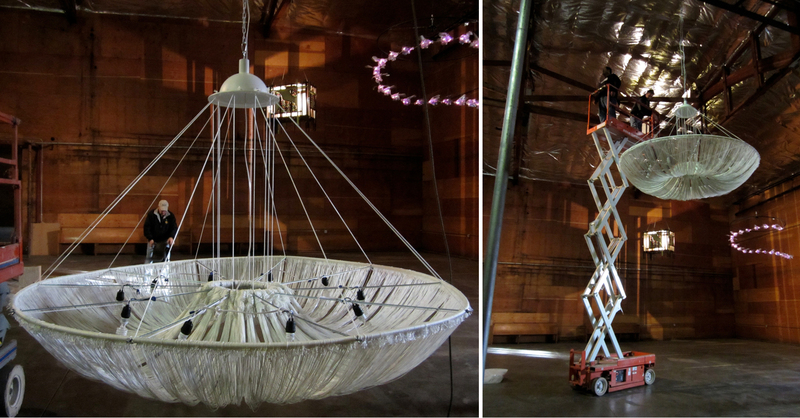 The chandelier is 6′-10″ in diameter and it took 4 people and 2 scissor lifts to install! Clements says “I’m obsessed with design and the process of making things” and she loves to feature salvage or recycled materials in her work. Currently, she is designing a jewelry collection and starting her own business. Contact her with inquiries (commissions are welcome) – she can be reached at elizabethjoyclements [at] gmail.com. * Mighty Tieton is an incubator for artisan businesses in Tieton, WA, with the goal of helping revitalize the economy of the town and region by combining creative and professional skills, and connecting with local resources to build successful businesses involving art, design, hospitality, and recreation.